It’s a little too easy to get wrapped up in your work, no matter what you do. I used to think that farming was worse because you never escaped; I just have to look out the window to find work staring right back at me. Nowadays everybody seems to be taking their work home…those laptops are just too convenient, so you can work even though you’re 30 miles from the office. This time of year in high season, I find myself constantly trying to get the bottom of a bottomless to do list….it’s never ending. So at times like these especially, it’s important to remind myself what’s important. Tonight, even though I had cucumbers to wash, boxes to set up, dirty dishes in the sink, and a CSA box and newsletter to think through, I got into the house before nightfall just to be with our kids and put them to bed. We didn’t do anything exciting, we just read a couple books, talked about a movie they like, and said goodnight. I have to admit there are nights when Maree needs to yell out the back door way past sunset to get me in while I feverishly try to finish “one last thing.” Well, I could find “one last thing” forever. This growing season more than ever, I’ve been mindful to carve out that time with family, friends, a good dinner like with a couple members at our workday last Sunday. And you know what? I’m no more “behind” than any year past, and, actually I’m feeling much better than years past too! There’s a reason my traditional farming neighbors stubbornly take 5 meals a day because they realized long ago that you can’t keep hammering away on work and think you’re getting somewhere. A little rest, some conversation, and you’ll save more time getting done what needs to be done. Dino Kale: also known as Lacinato Kale, an Italian variety…my favorite. Raspberries-This is the start…not in your box this week? Expect them next week (or even the following week). Coursely chop 4-6 garlic cloves. Put them in a mortar, add a pinch of salt, and pound until a smooth paste forms, which will happen quite quickly. (If you don’t have a mortar, chop the garlic and salt together until smooth.) Stir it into mayonnaise, add lemon juice to taste, then thin with hot water or leave it thick, depending on intended use. Note: This sauce also goes well with green beans, potatoes, asparagus, cooked carrots, and cauliflower. Use in a sandwich, or spoon into a soup or pasta. This time of year we enter what I call “high season”, when those warm-season crops come in and we’re at the peak of variety. We’re certainly a bit off the mark for the year because of the cold start, but we’re right on the cusp…I found about 5 mature cucumbers yesterday! This is far from enough for the whole membership, but a good sign. We also found about 4 quarts of beans ready to go, again, close but not close enough. Still, even though it means more work for me, I really like high season. It’s exciting to take in big quantities of beans, peppers, and tomatoes. I like pulling in bushels of corn early in the morning before most people are awake. It’s exhilarating. The bad part of high season is that weeds like it too…it’s tough to keep up the fight when you spend a lot of time harvesting. Even though I thought some beds looked pretty good a couple of weeks ago, if I look at them today, I get a little panic-y…”boy, I have to get to that, and that, and that…yikes!” Anyway, things seem to work out and the lesson is that you should celebrate what’s good and forget the bad part. Garlic: Not the best I’ve ever grown, but better than nothing. Beets: Not much, but it’s a start. Since you haven’t had chard yet due to the deer, you can use these greens too. Broccoli Raab: The bunched green with jagged edges. This is pretty standard in pasta recipes or as a side. 2 Daikon Radishes: A white radish with a peppery taste, salt mellows it out. Some Thai Basil: This likes to put on a lot of buds (probably wants more heat…I’m thinking it gets it in Thailand), but the leaves seem good. It is a bit different from your standard Italian Basil…check it out. Meanwhile, peel and coarsely grate the carrot and place it in a serving bowl. In a small bowl, mix together the sugar, vinegar and sesame oil and set aside. When the Daikon is well drained, stir it into the carrots. Add the vinegar mixture and toss well. Slice the scallions thinly on the diagonal and mound them on top of the salad. Heat the vegetable oil until smoking and immediately pour it over the scallions. Toss well. Serve at room temperature or chilled. Serves 6-8. Note: You will likely need to halve the recipe (or use more carrot) and could use the red onion from this box instead of scallions. 1. Newsletter. I know a number of members are not automatically receiving the newsletter by e-mail. I think the problem comes in with so many computer firewalls not accepting a bulk e-mail. I suggest you go to this website at http://www.lidafarm.com and check each week. The same is on the web as in the e-mail and I typically post late thursday night or friday morning before deliveries. You can try to subscribe again, but putting your e-mail in the “subscribe” textbox at the right…you need to reply to the confirmation e-mail you receive to finalize the set up. 2. Workday. We’ll be hosting a workday next Sunday, July 26 from 3-6 pm. This is a totally optional thing…but if you’d like to get your hands dirty and see the farm up close and personal, please come out. A workday is pretty common with CSAs. We’ll be doing general weeding–what I call hand-to-hand combat this time of year, row-by-row. At 6 we’ll be supply a light supper. Please e-mail or call to let me know if you plan on coming to plan for supper. Directions to farm…we’re halfway between Vergas and Pelican Rapids on Highway 4. 6 mi west of Vergas, turn right onto 275th ave. 8 miles east of Pelican, turn left onto 275th ave. Things have been a bit cool lately, but I was really thankful for the rain we got this week (almost an inch). We were getting worried about moisture levels out there, but it’ll be no problem for a while. Acually, since we have such a heavy clay soil, we can get away withought rain or watering for 2-3 weeks. I figured I’d write about organic ag this week and about certification in particular, simply because I feel like there are some real misconceptions out there and I’d like to explain where we sort out. I think there’s a lot of confusion simply because organic has gone through some changes in the last decade, the biggest being the National Organic Program (NOP), established by the federal government throught USDA. Today, when you say Organic, it means you grow according to the NOP standards and have been certified for doing so. Unless somebody sells less than $5,00o of food, you can’t use the term organic…you could actually be fined for doing so. Often, when I talk certification with people, they often say, “oh, doesn’t that take three years of not spraying your land?” Yes, and a whole lot of other things. When a certification agency is auditing and inspecting your farm, they want to know about all your inputs (fertilizers, insecticides, mulches, potting soil, etc.) and practices (cover cropping, cultivation, conservation measures on the farm) and they want to see record and documentation of such. So it isn’t just not spraying for three years that matters, it’s following these standards across the board and presenting an audit trail to prove it…no small matter. I’ve actully started an audit trail so we can become officially certified in a few years–even though we have only used certified inputs, I can’t prove a thing and need the records. So, I think often people have the impression that just because somebody grows organically, that they don’t use any inputs on the farm but manure and hard work, although that is a lot of it. For insects, there are organic sprays (some think this is an oxymoron). The only insecticide we use is called Pyganic, the chief ingrediant of which is natural pyrethrum, an insecticide derived from chrysanthemums. We also use a small amount of an organic fertilizer called Renaissance. It’s actually a mix of soybean meal, feather, and bone meal. We mainly use it to sidedress the sweet corn, which is a pretty heavy feeder. Both of these are OMRI-certified, which is the agency which certifies whether a product meets the national organic standards. Otherwise, we do use a fair amount of composted manure for fertility, both from our sheep and from a neighboring turkey farm. Boston Fireball Lettuce: By far the prettiest lettuce I’ve grown…also called “bibb” or “butterhead” It’s can be a bit bitter, almost like endive…you may want to mix with the greenleaf. Greenleaf Lettuce: variety called Marin after the county in CA. This is the end of the lettuce, so put into a plastic bag and leave in the refridgerator…it should keep up to three weeks. “Spring” onions: one torpedo onion and one sweet. Lightly salt zucchini and set aside in a colander to drain for 30 minutes. Meanwhile, mix the remaining ingredients together except the oil and pepper. Quickly rinse the squash, sqeeze out the excess water, then stir into batter. Taste for salt and season with pepper. Film two skillets with olive oil. When hot, drop in the batter-quarter cup makes a fritter about 3.5 inches across-and cook over medium heat until golden on bottom. Turn and cook other side. Serve hot…serves 4. Well, things are finally starting to grow. Since it’s been so warm lately, I forget how cold it was earlier in the year, and I wonder why things aren’t ready for harvest. But those days in May and early June make a real differencel on when things are ready. But I’m thankful for the warmth…it allows us to watch those warm-season crops take off and finish off the cold season ones (like the spinich which made it in the box before it “bolted” or went to seed). I’m also thankful for the mild rain we had yesterday instead of the “monster storm” we were supposed to get. I feel that we’ve already had our hail for the year and don’t want another round. One new development for the year is our new packing shed where we bring in all the produce to be washed and packed in boxes. The shed isn’t exactly new, but we converted our machine shed for the purpose. Up til now, we’ve used the greenhouse, which isn’t optimal for a number of reasons. One being that it’s just a dirt floor and after sloshing around water for a while, I always find myself in a big mud puddle….the heat of the greenhouse didn’t help either! The set up of the packing shed is pretty important. It’s kind of like a little manufacturing plant…produce comes in, goes through a couple stations and finished CSA boxes go out. I have it set up with all the washing tubs on one side and the tables which hold the boxes on the other. We have a whole bank of tubs and sinks so that we can soak a different crop in each tub for a while, since it’s really important to hydrocool produce for a good half-hour to take out the field heat. If we didn’t do this, the produce would look good when you first get it and then mysteriously go bad in a couple days. In the back is our walk-in cooler–out of the way–where things can be held over for a while. I even just got a set of roollers (kind of like a conveyor belt with rollers) which we’ll be settting up to lessen the time we spend shifting crates of produce around…when the boxes are done, we’ll be able to just count them off and push them down the rollers to the van instead of take two at a time, walking back and forth from the van. Napa Cabbage (see recipe): the recipe is for a cold slaw, but napa is a traditional stir-fry stand by. I like cooked more myself. Braising Mix: this is a mix of young greens which can be sauteed on their own with some onions or garlic or added a stir fry at the very end. Just chop and fry. Red Oaklead Lettuce: one of my favorites…it’s pretty and has a nice nutty flavor. Whisk together vinegar, sugar, ginger, oil, chile, and 1/2 teaspoon salt. Add remaining ingredients and toss well. Let stand, tossing occasionally, 10 minutes. If you grow organically, you have to learn to cultivate and there’s a lot to it…hence the art. The term is used pretty generally nowadays to mean “grow” or “nurture” things as in “Target has been cultivating customers through their new marketing plan…” Stuff like that. But in farming cultivation means something quite specific: breaking up the ground with a cultivator to kill weeds. I cultivate in a couple of different ways. One is what’s called “blind cultivation”, where you drag a cultivator right over the top of the bed, including the plants. 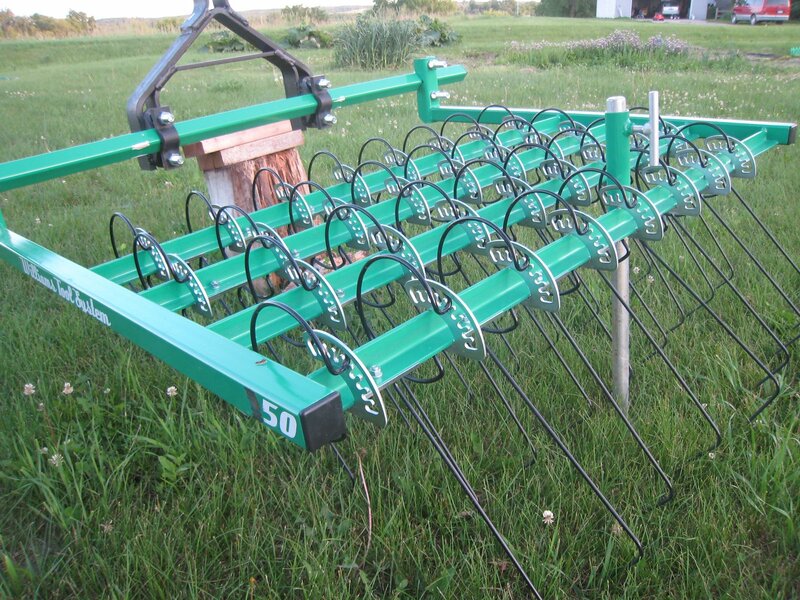 I do this with our new contraption of the year, a Williams Tool System, which is a kind of tine weeder. I always feel like I’m going to kill all the plants, but the tines are designed to put on enough pressure to take out the little weeds, but leave the rooted plants. It has done great work and things like the corn, onions, and potatoes havn’t looked this weed-free before. The other way we cultivate is with a traditional two-row cultivator, which has these shovels and knives on either side of the row to take out anything between the plants. This sounds pretty straightforward, but a grower needs to keep a fine eye to details to cultivate well, and, frankly, I’m not that great at it. The timing has to be right (best when a lot of weed seeds have germinated, but still just seedlings), the soil moisture good (too wet and you get clods to last the summer), the shanks and shovels have to be digging at the right depth (not too deep, not too shallow), and all the while you have to run the tractor as straight as the rows you planted in the spring or you take out half the row. So far, so good this year. When I got to thinking about cultivating, it made me think about a conversation I had with my neighbor Marvin last year. Since he’s farmed all his life, I asked him about how many farmers still cultivate and he figured about 5% since life with chemicals is so much easier…instead of cultivating 3-4 times, you can spray twice and kill off every single weed. I thought that was kind of low, but as I was driving around last year I saw only one person other than Marvin and myself cultivating a field! Keep you eye’s peeled…you may still see some out there. Weather report….hail last saturday, but not terrible. You will probably see some holes in the lettuce, but I promise it will taste the same. Kohlrabi: simply peel, cut, and serve…some recipes call for the greens. Garlic Scapes: the tops a garlic plant will send up…like a garlicy green onion. Chop fine, sautee a bit, and throw in mashed potatoes. Boil potatoes until tender. Steam kale separately until tender, about 10 minutes. While potatoes and kale are cooking, heat butter or margarine in a large pot. Saute onion until soft. Mash potatoes, add kale, onion, milk, salt, and pepper. Mix well. Reheat and adjust seasonings.